Are you familiar with Crystal Paine from Money Saving Mom? If you are then you know that not only does she offer real life advice on saving money and living frugally but she also inspires her readers to live simplified, organized and purposeful lives. 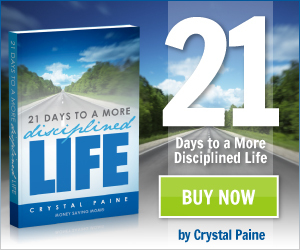 In November of last year, Crystal did a blog series called 21 Days To A More Disciplined Life. The idea behind the series was that Crystal would spend 21 days intentionally focusing on discipline in her life and blog about her experience. She would be focusing on things she wanted to accomplish in her daily life and be breaking them down in to manageable steps. She also gave day by day directives on how to follow along in her endeavor as well as practical advice on how to achieve your goals. I loved this series and even though I read along faithfully and desperately needed to do the challenge along with her, I just couldn't find the time or the will power to do it. Excuses, excuses, I know. Clearly I needed to take the 21 day challenge so I could actually accomplish my goals. That is why I am so excited that Crystal decided to rework that blog series and turn it into an easy to read and follow along with ebook. I was given the opportunity to read and review 21 Days To A More Disciplined Life and I am so thankful for the opportunity. I was originally concerned that I wouldn't get much out of the book since I had already read the posts and am an active reader of Money Saving Mom. What I found couldn't have been further from the truth. 21 Days To A More Disciplined Life was an easy read, yet while I was able to read through it in two nights I know that I will now need to go through it again and follow the clearly laid out, daily plan for creating discipline in my life and accomplishing my goals. I like that I can have the entire plan at my fingertips to follow and I don't need to go back through a long lists of blog posts to follow along at my own pace. Don't say you will try, say you will! Tons of helpful hints, suggestions, and honest encouragement on ways to accomplish your goals and achieve discipline in your daily life. The best part? From now through Thursday, October 26th, you can get a copy of 21 Days To A More Disciplined Life for just .99 cents! And to make the deal even sweeter, for the next three days Crystal is also offering free downloadable calender pages and planner pages to help you on your journey. Make sure you visit HERE and order your ebook today! Have you already bought and read 21 Days To A More Disciplined Life? I would love to hear your thoughts in the comments! I did received this book for review and I am an affiliate for this book.